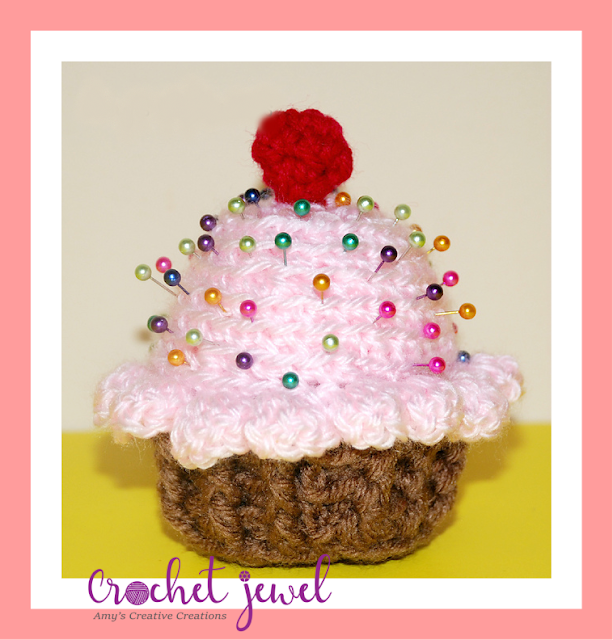 Enjoy this Cupcake Pincushion Pattern! It was fun and easy to make! My daughter loved placing all the pins all over the cupcake. Nice way to save your pins while you are being crafty! Rnds 8-9: Repeat round 7, for a total of two more times. Rnd 11: work 2 sc back loops, sc in the next 3 sc in the back loops, *Repeat around, Work in continual rounds without slip stitches now. Rnds 12-13: sc in each back loop around, *Repeat for a total of two rounds. Rnds 15-16: sc in each back loop around, *Repeat for a total of two rounds. Take Pink Yarn or stuffing and begin to stuff your cupcake as full as you can. Rnds 17-18: 2sctog decrease in each sc around, *Repeat this round for a total of two rounds. Fasten off, Weave in the ends. Shell Trim on Rnd 10: With Pink yarn sl st into round 10 sc, sc in the same stitch, work 4 dc in the next sc, ch 2, sl st in the same stitch, sc in the next sc, work 4 dc in the next sc, ch 2, sl st in the same stitch, *Repeat around, sl st. Fasten off, Weave in the ends. Rnd 4: 2sctog decrease 5 times, sl st. Fasten off. Stuff the cherry with some red yarn and Attach the Cherry on top of the pink cupcake. Pins: Push the pins all over the pink part of the cupcake.